Formed 4.1.42 at Lechfeld from Stab/SKG210. 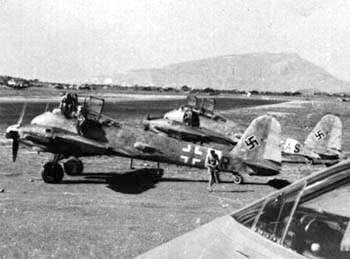 Formed 1.5.39 from I./ZG141 at Jüterbog-Damm. Reformed 4.1.42 at Lechfeld from I./SKG210. Reformed 10.43 at Brest from V./KG40. In 8.44 moved to Welzow and was renamed II./JG4. 2./ZG1 at Vannes, 1.44 - 14.6.44 and at Chateauroux, 15.6.44 - 16.7.44. Formed 1.5.39 from 1./JG333 and transferred from Herzogenaurach to Fürstenwalde. Known as Jagdgruppe 101 between 8.39 and 1.3.40. Reformed 4.1.42 at Bryansk from II./SKG210. In July 1944 renamed III./JG76. Formed 1.42 at Lechfeld from four short-range reconnaissance staffeln. Reformed 2.2.44 at Bordeaux-Merignac from 7./ZG1 and 1./SAGr.128. In 8.44 moved to Alteno and was renamed III./JG4. Formed 4.1.42 in Deblin-Irena from Erg.Gruppe/SKG210.